While it’s unarguable that any facet of our existence could ever be separate from Primordial Awareness, we are deeply conditioned to believe that the undesirable aspects of experience, and especially the mouldy contents of the compost heap called the unconscious, can’t possibly be valid components of Ultimate Reality. It’s deeply heartening to see this illogical, fragmented view being explored and corrected sensitively and wisely by teachers like Ellen Emmet. Ellen’s beautiful article was originally posted on contemplativejornal.com, under the title The Sacred Body: Returning Our Experience to Its True Source and Substance of Awareness. We all remember blessed moments in which our true nature of pure undivided and universal Awareness echoes at the emotional, tactile and sensual levels of experience. Our body then is felt to be transparent, without borders, suffused with a subtle quality of vibrating sensitivity. It feels less personal yet shares itself intimately with all that is met. For most of us however the body has been deeply and lastingly conditioned by the belief that “I” refers to an individual and limited person, located inside a body, separate from others and from the world out there. Thus the feeling of the body is rooted in a set of repetitive psychosomatic habits, creating feelings of solidity, density, emotional inertia and contraction designed to validate and perpetuate the projected image of the “I” that seems to live at its center, with one’s past and future on either side. Such a body’s inherited dynamism is ruled by the complex and restrictive impulses to protect, defend or affirm itself. In this way, the body-mind seems to become the envelope or the cage in which “I” appear to live in and the stuff that “I” seem to be made of, whilst the real “I” of undivided Awareness seems to have shrunk itself into confinement, limitation and fragmentation. When we awaken to our true nature of Awareness in the presence of a teacher or of a teaching, we submit our thinking rational mind to the pure light of intelligence that is its source and substance. With open, limitless Awareness as our invisible reference, we hear and understand that the ordinary awareness that is perceiving whatever is perceived in this very moment, “I”, is not contained within a body or located in time and space. We hear and understand that “I” is the Open Awareness in which all experience arises unfolds and dissolves, including thoughts, sensations, feelings and perceptions (mind, body and world.) We hear and understand that this Awareness is not a perceived experience, yet is that which perceives all experience, and is not an object, yet is found at the heart of all experience as its only and invisible substance. My identity fits not in any name or form. Nor am I held captive between birth and death. I am not the blood that runs through my veins or the warm breath that flows through my nostrils or the mouth that breaths. I am not the memory of myself or the hopes that skips like stones into the future. Past and future ripple through me as the wind of time, whilst space is the echo of my infinity. I am not this I am not this I am not this, yet I am the lover of all things, and find myself at the heart of all that has a name and form. However, it is important to further deepen our exploration to include the level of feelings, sensation, tactility and perception. Taking our stand as the field of open Awareness in which all experience arises, we listen to our experience of the body directly, as if for the first time, free of any labels, without any mediation from the past or any agenda for the future. We take our time, descending below the threshold of rational experience, allowing thought to relax in the background whilst opening to the flow of tactile sensation and subtle vibration that is our actual bodily experience. We are invited to see and feel that the body flows through myself, Awareness, as does all experience. When the welcoming of the body is open, uninvolved and global, it is as if the body like a frightened animal feels an unconditional invitation to come out into the open space. In this friendly loving field, the body stands naked and naturally begins to liberate what it had been holding in and as itself: the crystallized energy of separation that lives as layers of contraction and tension in the cellular, muscular skeletal and nervous systems of the body. As the body unravels in this way, the “me” charge that lives embedded in its layers is returned to the openness of Awareness. Gradually the body is left free to open to, relax into and reunite with the openness that surrounds it. It is as if each feeling and sensation like an offering, gives itself back to the invisible altar of Awareness, telling its true story on the way. In time this allows a gentle and natural realignment with the felt understanding that the body’s essential nature is this very openness. Over and over in this exploration, for which we may use guided meditation, postures, visualisations movement and breath, we are led to see and feel that in truth we cannot say that a sensation appears in “my” body, just as a sound does not appear in the world out there and a thought is not to be found inside a head. We see rather that sensation, thought and sound all appear in myself, non-located open Awareness without any separate individual existence of a body mind or world. Over and over again we realize that like sounds and thoughts, the bodily feelings and sensations are subtle in nature. They are not solid or tangible cannot be held or measured. Rather they are like vibrating ripples appearing on the surface of myself, intimately one with myself, made of my own invisible substance. We feel and know that the body is the openness that “I” am. Unlike most of the conventional approaches to the body that are taught in the world, this one is not a pragmatic endeavour intended towards the physical or energy body, to increase well-being, strength or flexibility, or even encourage expansive states of consciousness. Rather it is a sacred and devotional practice that surrenders the body back towards into its source of Open Awareness: what we only and always are. Every time the offering is made, the body is returned as it truly is, limitless, transparent, relaxed easeful and loving. It is realized as the very breath of the universe. Friday 14th October to Sunday 16th October 2016. A weekend in an intimate and peaceful setting during which we will share guided meditations, gentle explorations of the body in the tradition of the tantric path of Kashmir Shivaism, and conversations with the non-dual perspective as our shared ground. There will be delicious lacto-vegetarian meals and time for rest and walk in nature. Thursday October 20th to Sunday October 23d, 2016. I will be offering a yoga meditation session and a talk entitled The Sacred Body and participate in a panel entitled Full Embrace of Life. Two heart-healing poems from Chuck Surface. I found these on the poetry blog – being silently drawn – one of my favourite online oases for mind medicine. Thank you Tina Koskelo. First, the paradox of our wideawakeness: How can it be that we are not this or that but thisthat? How can it be that we are simultaneously wave and particle? How can we reconcile apparent dualism with the unsplitable reality of our experience? As it turns out, this endeavour on the part of the insatiable thinker is less paradoxical than it would have us believe. Like, can there be more than one meaning to ONE? And then, a little hymn to the Beloved. Without… She prefers milk chocolate to dark. Without… everything comes to Her, and goes. Without… She experiences ever changing manifestation. Without… She Shines, even in the midst of tears. Without… She is born, grows old, and dies. Without… within and without ever are. Without… cream, two sugars, please. As if She is not Present. And falls into Her awaiting arms. And argue Her existence, lawyerly. They know nothing of Her. In the Cave of your Heart. Chuck’s poetry website is In the Garden of the Beloved – a place to rest, and be both soothed and intoxicated. 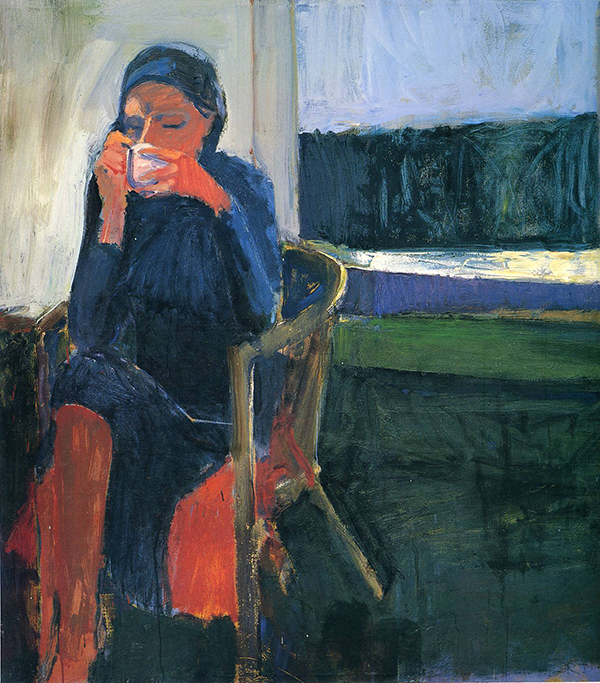 Richard Diebenkorn, Coffee, 1959; oil on canvas, 57 1/2 in. x 52 1/4 in. save those assigned by a bunch of brain cells? aside from the space-time grid in my memory? in the delicate dawn sunlight? is a figment of imagination? where does it leave my heart? For what shall it profit a man, if he shall gain intellectual knowledge of the world, and lose his own heart’s intimate intelligence? The Heart Sutra had to get a word in as well. Mark the Apostle meets Avolokitesvara. You never can tell what/who will turn up on retreat! Photograph by Alan Larus, who tells me he just “clicks the button”. His modesty is as awesome as his artwork.